This particular Spartan Fan blogging at ya was too young to get the thrill of seeing Spartan Hoop play at the old barn we call Jenison Field House. As cool as all that history is, I can&apos;t go back in time. That makes me a Breslin guy. No choice there. By the time I was of age to be going to see the Spartan basketball team they were calling the Breslin Center home and the Jenison would host hoop no longer...until this weekend. 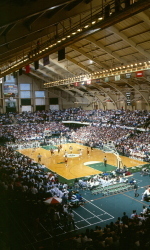 Come see history come back to life in the Jenison Field House as it hosts not only an awesome Alumni game and a concert but also will host the current Men&apos;s Spartan Basketball team versus Tuskegee on Saturday and the Women&apos;s team versus IPFW on Sunday. The "old Barn" will be rockin this weekend as the Alumni come back, and the current Spartans turn back the clock for a structural classic. All kinds of great Spartans from the past will be coming home for this unique experience, to either play in the alumni game, or just be on hand for the fanfare. That&apos;s everybody from Mateen to Magic! If you&apos;re a Spartan fan and a lover of basketball, this event could be the coolest thing you&apos;ve ever done. Three great days of basketball all hosted in a classic old-school venue? Sign me up! Cost for the Alumni game on Friday at 7pm is just $10. Be sure to book the next day at Jenison too though, as the current Spartans take on Tuskegee and treat the crowd to a live concert by the Commodores, just to keep with that old school theme, right?! Here&apos;s a quick look at the key info!